Maurice Beatson is starting to wind up for the biggest show of the season, after winning the the ESNZ Horse Grand Prix at the Manfield Park One Star Show in Feilding on Sunday. Aboard Centrico, Beatson headed off 14 other combinations to take the honours comfortably ahead of Danielle Maurer on Double Dutch who was the only other rider to go double clear. Four went through to the jump-off where a tricky line caught out eventual third and fourth place-getters Claire Wilson on McMillans Tipsey and Jamie Howie on Zalula. Beatson stopped the clock five seconds faster than Maurer. 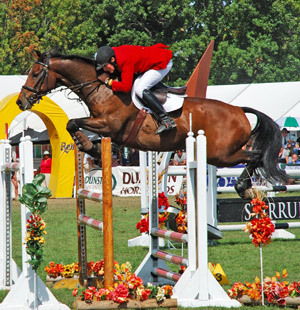 Centrico, a bay gelding who arrived from Germany two-and-a-half years ago as a stallion, has only done a handful of grand prix classes and is just starting to get established at that level. In the Country TV Pony Grand Prix Jordan Giltrap will forever remember her first big start with victory on Busta Rhymes. The débutante combination beat 17 others to take the honours. Just two went through to the jump-off where Giltrap went clear and runner-up Mat Irvine on Fun House had a rail. The main classes marked the end of a successful two-day show at Manfield. ESNZ Horse Grand Prix: Maurice Beatson (Dannevirke) Centrico 1, Danielle Maurer (Auckland) Double Dutch 2, Claire Wilson (Waipukurau) McMillans Tipsey 3, Jamie Howie (Taihape) Zalula 4, Maurice Beatson (Dannevirke) Schimmell Warrior 5, Simon Wilson (Waipukurau) McMillans Midway Smooth Dude 6. Country TV Pony Grand Prix: Jordan Giltrap (Taranaki) Busta Rhymes 1, Matt Irvine (Waipukurau) Fun House 2, Jake Webb (Hunterville) Jakaranda 3, Hannah Fraser (Feilding) Tony The Pony 4, Parys Marshall (Taranaki) Spot U Later 5, Brooke Jenkins (Wellington) Viva Pinata 6. Telford Young Rider: Logan Massie (Dannevirke) JJ Cloud Nine 1, Robert Wellwood (Hastings) Insightful 2, Robert Wellwood (Hastings) Cavallino 3, Jane Warren (Featherston) Dark Ages 4, Emily Fraser (Feilding) Maxamillion II 5, Claudia Porter (Hastings) Joia Hora 6. Caledonia Amateur Rider: Diana Cottle (Wellington) Morpheus Rising 1, Natasha Mazey (Pukerua Bay) Kabo Lunar 2, Barry Beatson (Dannevirke) Sloane Square 3, Tania Dickey (Taranaki) Kiwi Felix 4, Tracey Mason (Hastings) Southern Distinction 5, Graeme Isaacson (Waipukurau) Lykon 6. STH/LG Forge Pro Amateur Rider: Pearl Delaney-Girdlestone (Wellington) Windale Gracious 1, Sally Clark (Dannevirke) Victoria’s Secret 2, Laura Knight (Palmerston North) Sir Arthur 3, Helen Bruce (Palmerston North) Toblerone 4, Heloise Tolo (Wellington) Transcend 5. KiwiSpan Junior Rider: Rebecca Porter (Hastings) Mr Harrison 1, Larina Dolman (Gisborne) Kiwi Lansing 2, Emily Fraser (Feilding) Kiwi Relic 3, Will Moffett (Hastings) Kiwi Mimdie 4, Emma Thurlow (Taranaki) Clifton Ali 5, Emily Fraser (Feilding) Mr Munga 3 6. Canterbury Equestrian Five Year Old: Elizabeth Vincent (Wakefield) Vamped NZPH 1. Mitavite Munga Six Year Old: Elizabeth Vincent (Wakefield) Utah Jazz NZPH, Larina Dolman (Gisborne) Kiwi Lansing, Claire Wilson (Waipukurau) McMillans Fredrika, Maurice Beatson (Dannevirke) Lansbury Grosve, Claudia Porter (Hastings) Kiwi Jet, Maurice Beatson (Dannevirke) Mandalay Cove, Matt Dickey (Taranaki) Quando, Maurice Beatson (Dannevirke) Clearwater, Oliver Edgecombe (Waipukurau) Ultra Blue NZPH, Maurice Beatson (Dannevirke) Wishing Crown =1.